Don't mess with the marching band girls. A true story. The Fairbanks Marching Band will perform in the annual Memorial Day ceremonies at Unionville Center on May 25. Dress is Summer uniform. Music memorization includes The Victors, The Star Spangled Banner, and America the Beautiful. Report time is 9AM and we will warm at 9:15. The performance will be finished by 11AM. You can get all the details by clicking on the image above. This is one of our most important performances of the year honoring those who gave their lives for our freedom. ONU Honor Band - Congrats! Congratulations to FHSCB seniors Sara Schrader and Synthia Jester, who have been accepted in to the annual honor band at Ohio Northern University in Ada, Ohio. Synthia and Sara will be rehearsing and performing with the ONU bands, as well as nearly 100 of Ohio's finest musicians in the honor band. Their final concert is on Sunday, May 10, at 4:00 PM on the campus of Ohio Northern. Congratulations to Melissa Fink for being selected as the field commander for the 2009-10 Fairbanks Marching Band! Thanks to all who auditioned for this upcoming season. Are you a FMB veteran brass, snare, or tenor player? Do you need something to do in June? Are you interested in working with and learning from a top-12 DCI corps for two days and learn how to be a better player and marcher? 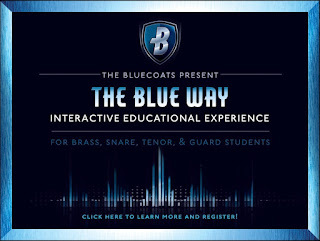 Click the link and find out more about The Bluecoats' "The Blue Way" Interactive Educational Experience. I was just made aware that none of my band or choir grades were showing up on Progress Book. After looking into this, I found that I had entered assignments due at the end of the grading period as 6/2/09 (which is the ACTUAL last day of classes) but Progress Book doesn't know this yet, so all points were hidden from the 4th nine weeks view. I have rectified the problem and now everything should be showing up as normal. Please let me know if you have any further problems viewing your band/choir grades. General music grades were not, and still should not, be affected. The FMB has been recruited to perform at an important public ceremony on May 15. The village of Unionville Center is dedicating a historical sign from the State of Ohio designating the community as the birthplace of Charles W. Fairbanks. Mr. Humble and Mr. Montgomery have asked that we perform this important civic duty. Band members are to all eat "A" lunch at 10:46 and then change into Summer uniform for the performance. Buses are to load at 11:15 and we depart at 11:30. The brief ceremony will take place at 12 noon. Students will return to FHS and be back in class by 1 PM. FMB members need to get their permission slip signed and returned by May 11. click the pic for more details and permission slip. 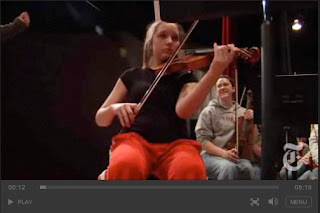 Mr. Rebmann shared this video article on NY Times with me yesterday. I had read the article, but not seen the accompanying video. It is wonderful, and powerful, and troubling, and depressing all at the same time. One lesson I hope all you Fairbanks folks take from this is to cherish what you have, and do what is necessary to preserve the arts in our school district for future generations. Be sure to watch the end of the video to see what the future holds for Tiffany, and the Newark High School Symphonic Strings. Don't forget to see the FHS Drama Club's presentation of "Robin the Hood" on April 17 and 18 at 7pm in Veteran's Auditorium in Marysville! FHSCB juniors and seniors who received a nomination invitation for the Ohio Northern Honor Band need to RSVP to me by Friday if you want me to include you on my nomination list. I feel badly that it is scheduled on prom weekend and you have to make a choice, but either choice is fine with me. I just need to know your intentions ASAP so I can invite some deserving underclassmen if there are spots available on my nomination list. conducted by the composer James Curnow. 6th Band: Listen to Your Music! 6th grade band members can listen to their concert music by visiting the "members only" page and clicking on the 6th grade folder. If you need a username or password, simply email me and I'll send it right to you. Use this listening experience to help you prepare for our May 19 performance by listening to learn, and also by playing along with the recording. 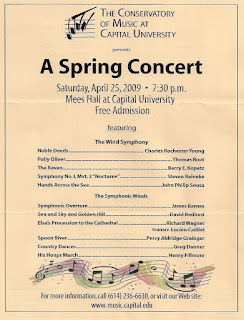 Want to see an amazing program of music by a first-rate university wind ensemble? The Capital University Symphonic Band and Symphonic Winds will present a program of music by Grainger, Fillmore, Wagner, Barnes, Reineke, Kopetz, Root, Sousa, and more! The best part is that the concert is FREE! The concert is on Saturday, April 25 at 7:30 P.M. at Mees Hall on the campus of Capital University. 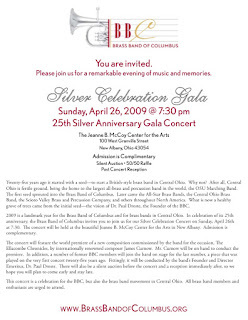 For more information, click on the pic to enlarge, call 614.236.6630, or visit www.music.capital.edu. Candy bars for the FMB sale will be in later today and available for check out. HS members my check them out today (4/14) and JH members can check out starting tomorrow morning (4/15). 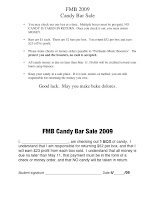 Click the pic to see the candy bar check out policy, or click here for more details. 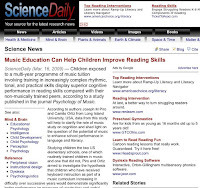 Much research has been done on the effects of music study on the brain, and the latest study reinforces the concept that studying music makes you a better reader. It's worth a read at Science Daily. 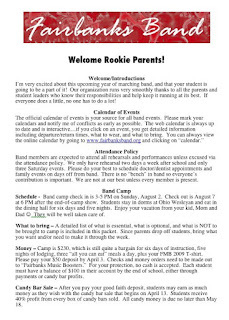 Did You Miss The Rookie Parent Meeting? If you missed the "rookie parent" meeting on Thursday, click on the image or click here to download a .pdf of what you missed. Band camp deposits are due today! Economy got you down? Need a lift! Need a laugh? Senior citizens and Young children FREE Pre-sale tickets at Fairbanks High School 4/13,4/14,4/15 during lunch. Marysville, OH 43040Feel free to forward this message to anyone who might need a break! 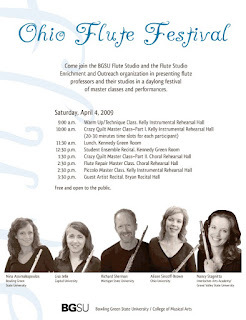 You are cordially invited to join us for our 2009 Spring Flute Fest this Saturday April 4th, from 9-5 p.m. located at Bowling Green State University, Moore Musical Arts Center. Participation is free and open to all ( donations accepted). Participants are also welcome to come throughout the day as their schedule allows. Our featured masterclass and gala concert guest artists are: Richard Sherman ( Flute Professor at Michigan State University); Alison Sincoff-Brown ( Flute Professor at Ohio University); Nancy Stagnitta ( Flute Professor at Interlochen Arts Academy and Grand Valley University) and Nina Assimakopoulos ( Flute Professor at Bowling Green State University).